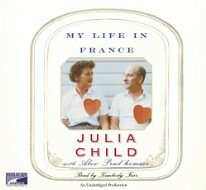 This is Julia Child’s memoir of, you guessed it!, her life in France, including her time learning to cook. I know this was co-written with Julia’s nephew, but man, did it ever have a strong sense of Julia’s voice. I was also amazed at how completely the meals that Julia ate and created in the 1950s were described. How could she really remember what she ate for her first meal in France so well as to describe it in exquisite detail? The detail was exquisite, though. She described the food with such passion and love that I almost actually wanted to eat the fish she was talking about, and I do not eat fish. She also inspired me to cook more, and to borrow her cookbook from the library – although I never actually made anything from it. My only qualm is that she seemed to jump quickly from ‘I don’t really cook’ to “I love to cook and want to learn more!’ It didn’t feel like a very smooth transition. I thought this was a lovely audiobook, with mouth-watering descriptions of food and enticing descriptions of life in France post-World War II. I absolutely LOVE Julia Child, and this book is probably on my top ten ever. I cried at the end. She did definitely go from zero to sixty on the cooking thing, but I think that was just her way. She did everything with mucho gusto. Carl read this after we saw Julie & Julia and he really liked it. I have his print copy and hope to read it soon. I have listened to about half of this one and had to take it back to the library. I think I’ll check it out again and finish it up because I really did think the narrator brought the story to life. Also i picked up a new copy of this book for 25 cents so I could read along if I so desired. I like the sound of this one…. I may have it on the TBR shelf in book format, I will have to look. I loved this audiobook. You’re right – Julia’s voice came through loud and clear. Excellent review. I too loved this audiobook and Julia really shone through. I love that she wouldn’t let this book be published until after her death — so she could be truthful. Just wanted to thank you for linking to Weekend Cooking — I’m hoping lots of people click through and pick up on this great book. I loved reading this book (in print, and before blogging), it is so much better than “Julie and Julia” which I could not even finish. “A Life in France” is one book I wish more people would read — I recommend it often! But she was so funny, and didn’t take herself, or the food, oh so serious and made it seem accessible. I love Julia and I adored this book. The descriptions of the food made me so hungry. I have a few of her cookbooks too which are invaluable in the kitchen. I should try this as an audiobook. I finished this book a couple weeks ago and feel the exact same way. She remembers her life in such meticulous detail, its crazy. I have definitely started cooking more after reading this book, and make more frequent trips to the local farmers market to buy most if not all of the dinner ingredients! I loved this book! Can I post a link to your review on mine? My weekend cooking project was a dud. Julia would laugh at me. I loved this book-I am happy I read it long before the Julia and Julia movie. I must say I was not a fan of hers until I read this book and then it changed my mind. Must read or listen to this one. I’d be a bad foodie if I didn’t! I snagged a paperback of this book at a recent library sale. Glad to see you enjoyed it on audio as well. I just loved this one. What a fantastic woman! I love to watch Julia. I don’t think I’ve ever given serious thought to her books, though, because I tend to consider French cooking “out of my league” so to speak. She’s just great to watch and get basic tips from. This sounds like a great book, though. Beth, I’ve got to check out your site. It looks wonderful.